Looking for a great gift for kids? 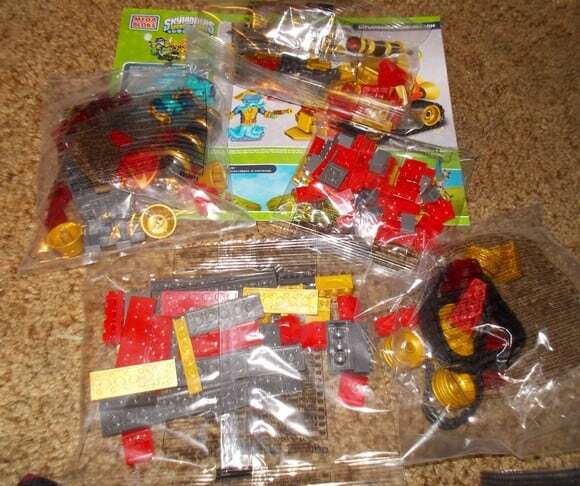 Check out this awesome Mega Bloks set! 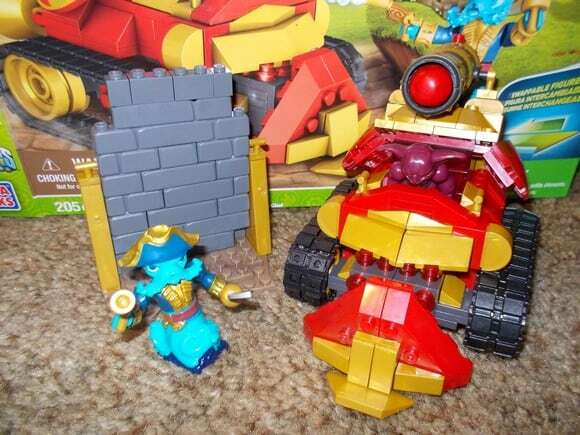 We received a Mega Bloks Skylanders Swap Force™ Boss Tank Showdown set to facilitate this review. All opinions are our own. Skylander Swap-Force is pretty much the number one gift for kids this year, at least as far as my son is concerned. We jumped on the Skylander bandwagon two years ago with the regular Skylanders (now called “series one”). Then last year it was all about Skylanders Giants. This year, there’s a whole new Skylander in town and this time he can swap body parts with his buddies! Hey, I’m pretty excited about this, and I’m 38! Wash Buckler character and an Evil Glumshnks character in his battle gear. A buildable wall to “smash” through with the projectile that launches from the cannon. 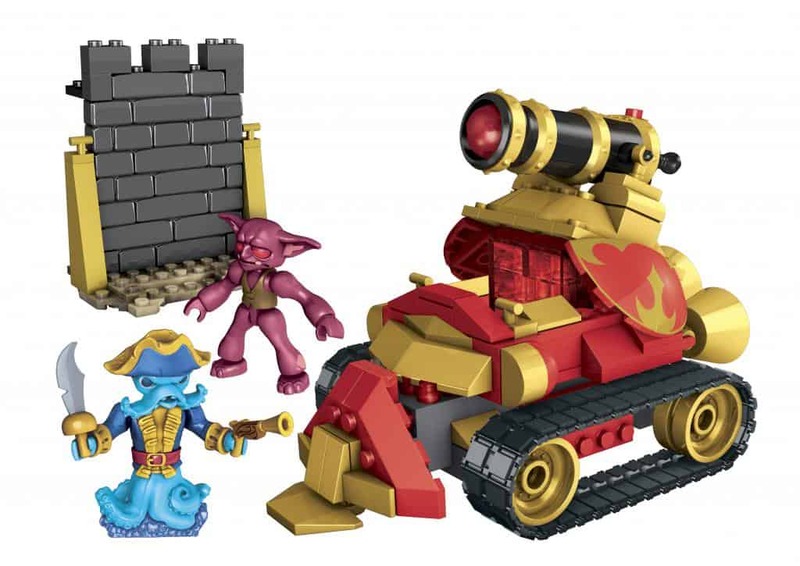 The set can be combined with other Mega Bloks Skylander Swap-Force playsets to keep the action going! Let me tell you what I love, love love about Mega Bloks- aside from the super cool sets, that is: The directions are super easy to follow! This is majorly important to me. I have very little talent when it comes to assembling things. Now, I know Jacob is supposed to be doing all the assembling, but honestly, he puts the smaller parts together and I end up doing the bulk of the work. He loves playing with them but he’s still at an age where he wants me to do the heavy lifting. Back to my lack of assembling talent. I inevitably put something on backwards or upside down whenever I put something together. Whether it’s a new toy or a piece of furniture. I can’t tell you how many bookcase backings I’ve put on wrong! Good thing I fill the shelves with books to hide it! I love how the pieces are packaged in baggies in a way that makes sense, too, so you’re not here and there and everywhere looking for the right pieces for each part of the process. First, it actually looks just like it’s supposed to, which means that I didn’t put any pieces in the wrong place! Yay for me! Second, the cannon launcher feature works fantastic. It actually shoots pretty far and is easy to aim at the breakaway wall. Major plus for Jacob’s adventures. Finally, I love that you can swap body parts with the characters! Technically, I don’t think you’re supposed to swap the good guy’s head with the bad guy’s (Jacob seemed pretty annoyed that I did this and switched it right back! ), but I thought it was pretty cool that if you wanted to create strange combinations, you can! This is such a fun gift for kids who love Skylanders Swap-Force. Younger kids ages 5 and up will really enjoy playing with the characters while even older kids will love displaying them as part of their Skylanders collection. Jacob plans to do both- play, then display. 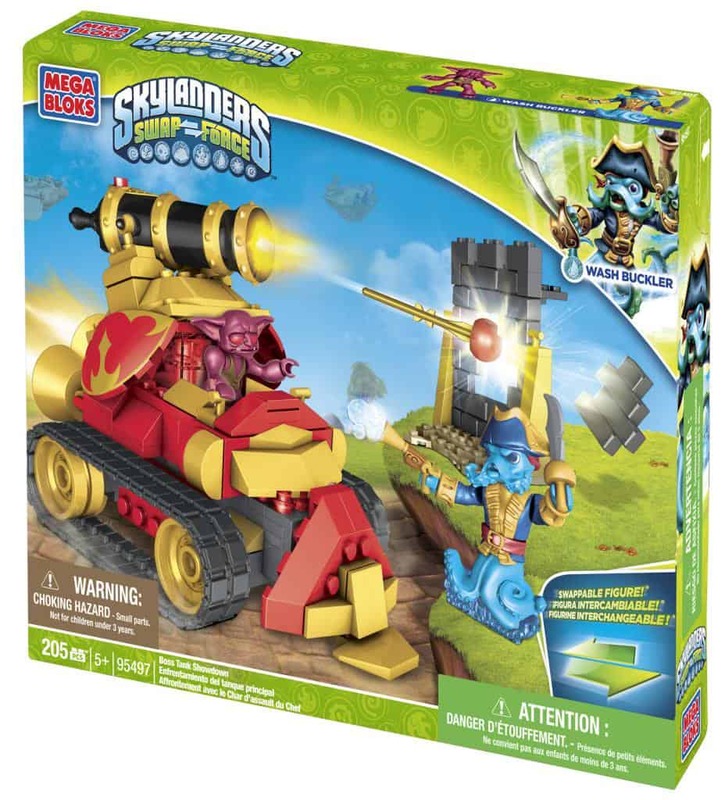 Check out the Mega Bloks Skylander Swap-Force Boss Tank Show Down Product Page and explore other Mega Blogs Skylanders on their Official Site. Keep up with news by following @MegaBloks on Twitter and liking Mega Bloks on Facebook. Skylanders SWAP Force™ ©2013, MEGA Brands Inc. ©2013 Activision Publishing, Inc. All Rights Reserved. I would like to try out Dark Castle Conquest. dark castle conquest building set! I like the Evil Airship construction set. I’d love to check out Flynn’s Rescue Ship. Thanks! Dark Castle conquest looks like it would be lots of fun. My son would LOVE Crusher’s Pirate Quest!! The boss tank showdown looks interesting. We would love to check out Dark Castle Conquest. Skylanders is all my nephew is talking about for Christmas this year. Thank you for the chance to win. The Dark Castle Conquest looks fun! my son would love the pirate ship one too! Would love to also check out ARKEYAN COPTER ATTACK, my kids love that part in Skylander Giants! The boss tank showdown set! My grandson loves building with these. My grandson’s would love the Pirates one. I’d love the Boss Tank Showdown. Super cool! I like the Dark Castle Conquest. Sharpfin’s Jet Boat looks pretty cool, too! I think the Dark Castle Conquest and the Crusher’s Pirate Quest both look cool. My boys would like the Sharpfin’s Jet Boat. Our Grandson would love the Crusher’s Pirate Quest. He is a big pirate fan. Thanks for the super giveaway opportunity. Keep up the exceptional blogging. My grandson would love the Dark Castle conquest, and I’m sure his dad would love it too! I would also like Crusher’s Pirate Quest. My grandson would like the Evil Airship. I think the kids would like Flynns battle ship and the fire viper attack set. My oldest son would love to have the DARK CASTLE CONQUEST set. My grandsons would also love the ULTIMATE BATTLE ARCADE. My daughter loves this kinda stuff. I like the Fire Viper Attack set. I would also love to have the Sharpfin’s Jet Boat. These are so cool! My son would probably like the DARK CASTLE CONQUEST set. 5 Real Life Laundry Situations You Never Think About Until You Have a Toddler!